Tall Texan RV Park and Cabins is privately owned. The camper accepts camping privileges with the understanding that he/she does hereby release Tall Texan RV Park and Cabins, its officers and employees of all liability for loss or damage to property and injury to his/her person arising out of his use of its camping facilities, and agrees to indemnify Tall Texan RV Park and Cabins, its officers and employees, against claims resulting from loss or damage to property or injury to the person of any member of the family or guest of the registered camper arising out of the use of its camping facilities. Tall Texan RV Park and Cabins is operated on a seasonal basis only. Short term rental space is available on a variable rate structure from one day to five months. Rent payment shall not constitute or create any form of residence or long term rental agreement between Tall Texan RV Park and Cabins and its guests. The payment of any space rent to Tall Texan RV Park and Cabins shall constitute an implied consent agreement by which the guest agrees to accept and comply with all the rules, regulations and operating policies established by Tall Texan RV Park and Cabins. 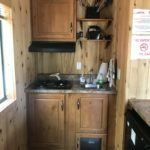 Tall Texan RV Park and Cabins reserves the right to change, modify, add or delete, at its sole discretion, the rules, regulations and operating policies. Rented spaces shall be used exclusively by registered guests of Tall Texan RV Park and Cabins. Tall Texan RV Park and Cabins must be notified by registered guests prior to third party visits. Third party visitors must register with Tall Texan RV Park and Cabins on arrival. Tents shall not be set up in RV sites. Guests that have visitors are responsible for informing such visitors of the rules and regulations and shall be responsible for the conduct of any such visitor. 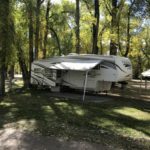 The Tall Texan RV Park and Cabins implied consent agreement is exclusive and nontransferable and is an agreement between Tall Texan RV Park and Cabins and its specific guests only. Multiple ownership, i.e. ; partners owning one recreation vehicle and the consequent use of space by multiple owners, is prohibited. In the event of the sale of any vehicle, Tall Texan RV Park and Cabins, at its sole discretion, reserves the right to terminate the continued use of any space such vehicle shall occupy. In the event of such sale, no rent payment or proration of rent payments will be applied from one guest to another guest. Parking shall be limited to one support vehicle per rented space. Parking for additional vehicles or visitor parking shall be assigned on a case-by-case basis only. If parking for additional vehicles creates a nuisance or unsafe condition, such additional parking may be denied. Boats and/or trailers may not be parked or stored in the RV spaces, but shall be assigned separate designated parking spaces within a designated storage area. 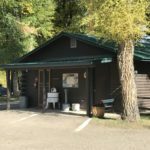 Guests of Tall Texan RV Park and Cabins are expected to maintain a clean and orderly appearance in and around the campsites. No accumulation of trash or junk is permitted on any space. Landscaping which creates maintenance or lawn mowing problems is not permitted. The placement of any storage shed must be coordinated and approved by Tall Texan RV Park and Cabins. At the sole discretion of Tall Texan RV Park and Cabins, no vehicle, or RV which is deemed to be unsafe to occupy, or which could cause an unsafe condition for other guests of Tall Texan RV Park and Cabins shall be permitted to remain on the premises. All wind breaks and screened porches must be factory made for the specific awning or RVs and approved by Tall Texan RV Park and Cabins. Guests and their visitors assume all risks to their persons and their property while on Tall Texan RV Park and Cabins property. Tall Texan RV Park and Cabins shall not be held liable for any act of nature or acts of any guest, visitor, or intruder that may adversely affect any guest or visitor. Guests are expected to carry their own personal property and liability insurance for themselves and their property while camped at Tall Texan RV Park and Cabins. Tall Texan RV Park and Cabins shall not be held liable for any disappearance or destruction of any guest’s property while it is parked or stored at Tall Texan RV Park and Cabins. Pets must be leashed and attended at all times and not allowed to run at large. Guests shall walk their pets in the established “dog walk” area only. Guests shall be held responsible for any act of any pet which creates a disturbance or other nuisance at Tall Texan RV Park and Cabins. Nuisances and noises which are annoying to other guests (at the discretion of Tall Texan RV Park and Cabins) will not be permitted. Sewer line connections must be reasonably sealed by means of a “sewer donut” or connection device that does not allow odor to escape the connection. Clothes lines are not permitted. Tall Texan RV Park and Cabins reserved its address and mail delivery for itself only. Guests that receive mail at Tall Texan RV Park and Cabins’s address do so at their own risk. Tall Texan RV Park and Cabins assumes no responsibility for Mail delivery to any of its guests and shall not be held liable for any loss of any guest’s mail. Portable electric heaters, air conditioners, and deep freezers are not to be used without notifying Tall Texan RV Park and Cabins and electricity being metered. Auto repairs, including oil changes, are not permitted. The discharge of any toxic material of any kind is not permitted on Tall Texan RV Park and Cabins property. Any guest or visitor who discharges any toxic material of any kind, shall be held responsible for the cleanup and repair of any ground, sewer line, or other property of Tall Texan RV Park and Cabins.